The third biggest Grand Slam of this year 2012 is Wimbledon Tennis tournament. It commenced from June 25 and ends on July 8, 2012. Are you a fan of Wimbledon tennis matches and want to know match schedules of the tournament? 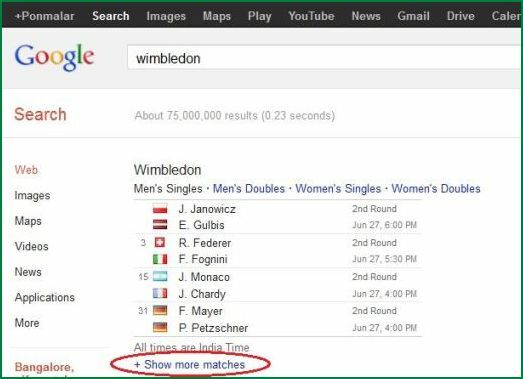 There is an easy way to see the schedule of Wimbledon games on Google search itself. So you no need to search other sites on Internet. Google adds this search facility of Wimbledon Match Schedule. We can get easily the daily schedule and group wise schedule. 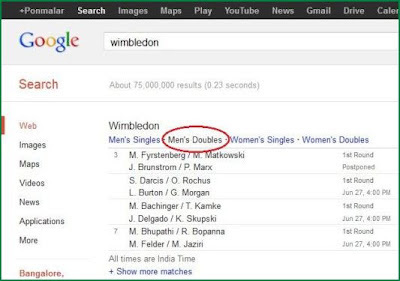 Just go to Google.com and type “Wimbledon” on the search box. Now you can see the daily schedule of Wimbledon 2012 below the search box as the first result. Some of few matches only displayed in that result. If you want to see full or more schedule, click on +show more matches link. Other feature is you can view group wise schedule like Men’s singles, Women’s singles, Men’s Doubles, Women’s Doubles. That is displayed as menu, so you can easily view by groups. Do you having any smart phones of Android or iPhone? 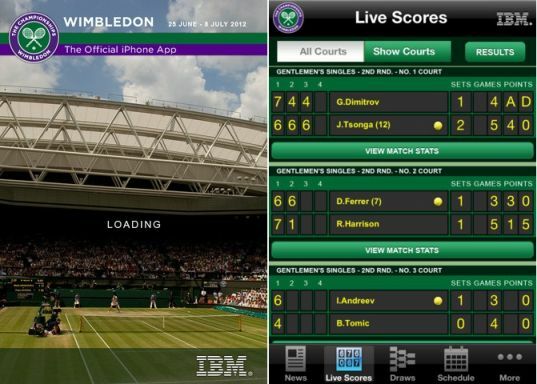 An official Wimbledon application released for Android and iPhones. With this application you can get live scores, results, match Schedules, news, profiles, videos and photos of Wimbledon Tennis tournament 2012.